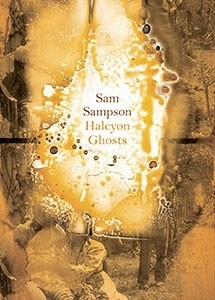 Sam Sampson’s new poetry collection, Halcyon Ghosts, brings together ‘thirteen shapes of knowing.’ It comprises thirteen poems that form various shapes or stamps upon the page. 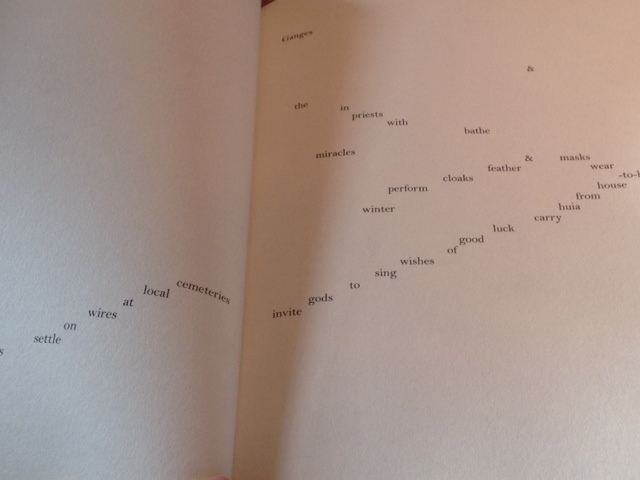 You can trace a bloodline to concrete poetry where the visual mark is as much a protagonist as the poem’s internal movement. You witness debts to the legacy of language poetry and you absorb the lyrical score. These poems are crafted by a poet who is part musician, part philosopher, part documentary filmmaker, part family archivist. At times the physical detail is luminous — as though capturing the landscape, the living breathing world momentarily (‘white melodious throat’ ‘riparian light/ blinking on a dark field’ ‘ceramic wind chimes/ charred grape seeds’). Or snatches of action and activity whether strange or unsettling (‘picadored green people tethered to years’ ‘ghost moths generate night skermishes’). Words can be snapped in half across line breaks. These are poems caught in half-light, in fragmented sideways glances (‘to seize shadows I grab them by the sleeve’). Words zigzag across the page in discrete phrasing. Making authorial imprints. Stammering and staccato, as though this poet is out of breath, holding back, puffing out poems in little linguistic clouds. In ‘The Kid,’ it is as though you can hear the click and stutter of Chaplin’s reels as the shifting frames catch light and dark (‘listen in-/tently to that blind/ mazy course/ running wild’). Colons are separated out to prolong the resting spots, the moment of pause (‘a mil : ‘). They act as little hinges, pivots in a collection where juxtaposition is a fertile device (‘Circles the expanse expands dirt’ ‘pin-pricks of the world … name-sakes’). Such pairings provoke an oscillation of mind and eye, a semantic quiver, a visual twitch. 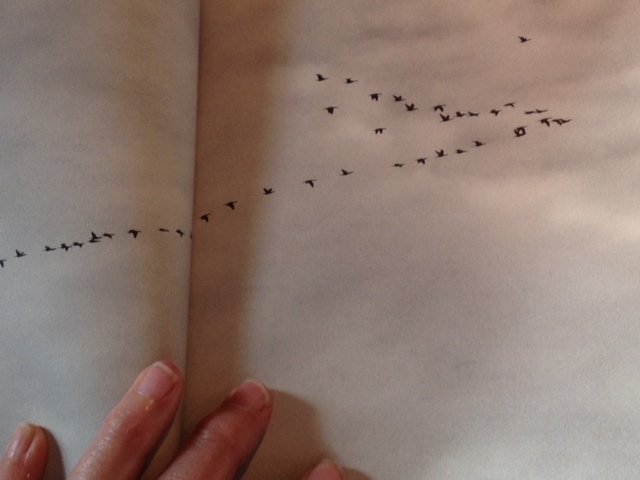 I loved the sequence, ‘Halcyon Ghosts,’ where the poem’s shapes imitate so perfectly the photographs of birds in flight upon the preceding pages. Here the words take pleasure in the measured steps of lift and fall. These are poems of return, with the flight path etched in your mind ready to accept the swift wing beat of the bird. Glorious. Elsewhere a horizon line imprinted on the page breaks a poem in two as though refracting and reflecting. Yes, the poems are visual gifts for the eye, but what instils a deeper imprint is the intellectual and lyrical movement. The language is eclectic and difficult, yet there is heart here. Life. Experience. Contemplation. Surreal twitches. 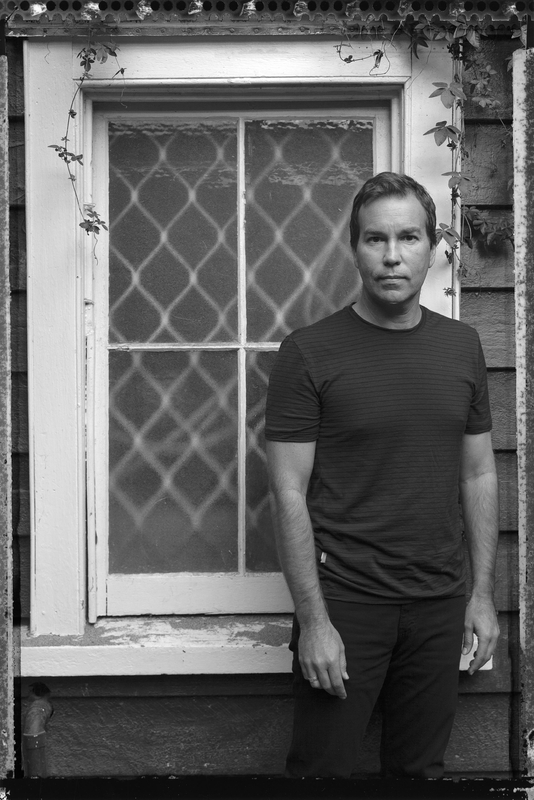 Sam has refreshed the life and expectations of concrete poetry, he has a bloodline back to Language Poetry but has stepped out of its limitations and has composed a symphony in parts where words are substitutes for the musical notes of melody. Breathless and breathtaking. Thanks to Auckland University Press I have a copy of this book to someone who likes or comments on this post (NZ addresses only). This entry was posted in NZ Poets, Poetry and tagged Auckland University Press, NZ poet, NZ Poetry review, Sam Sampson on October 7, 2014 by Paula Green. It’s a really interesting book, and unlike anything else being written here – though as you say, the influence of Language and related poetics is strong. One thing I’d add is the clear allusion, in the book’s structure and imagery, to Wallace Stevens’s ‘Thirteen Ways of Looking at a Blackbird’. Good point. So many have taken that has a structural arc for a poem. Particularly apt here with the presence of the birds in so many ways. So much you can say about this book. I left it with regret but I have about 20 poetry books begging attention and I am on on tour in five days. Too busy at the moment.